Most orthotropic material rely on the parameter AOPT to define the change/update the default material axes defined by LS-DYNA. The default axis for every shell element is based on the order of the node numbers if INN=0 which is then based on N1-N2 and the cross-product of N1-N2 and N1-N4. The default material axes may not necessarily coincide with the direction of the intended axes for a given material. 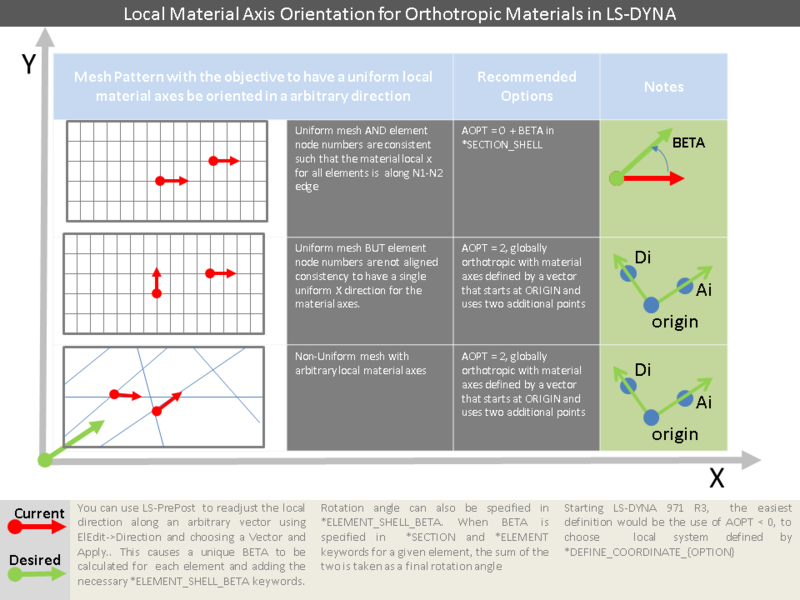 To help reorient the default material axes, LS-DYNA provides the parameter AOPT to reorient and further rotate the reoriented axes by using the BETA parameter in *SECTION_SHELL and/or *ELEMENT_SHELL_BETA. The following table attempts to illustrate this. I have ignored AOPT = 3, as I am yet to find a better way to illustrate it in a easier way but I will update it when its done.